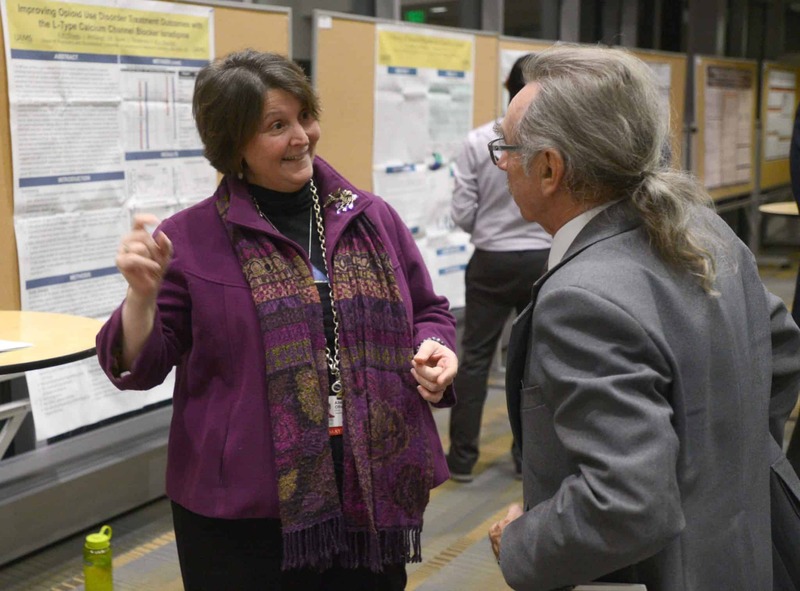 UAMS researchers present their work investigating methods of combatting the opioid epidemic. Nov. 27, 2018 | A variety of solutions with which to attack the ongoing national opioid epidemic took center stage at the 22nd Showcase of Medical Discoveries, held Nov. 14 in the UAMS Winthrop P. Rockefeller Cancer Institute. The series is intended to foster scientific collaboration by sharing research through social receptions with poster presentations. It is sponsored by the College of Medicine and Division of Research. Researcher William E. Fantegrossi discusses research into abuse liability of fentanyl analogues. 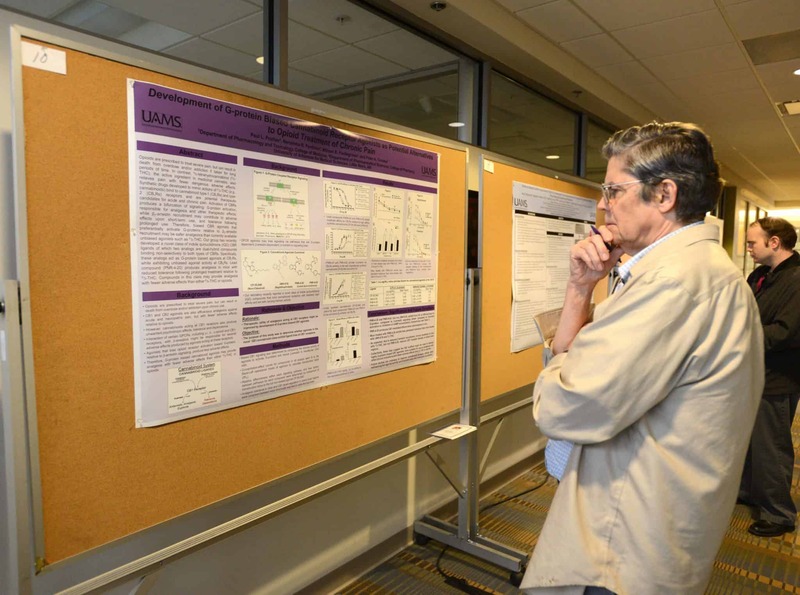 The research on display included exploring viable medications to use as an alternative to opioids, to treatment of addiction as well as withdrawal, to studying emerging illicit opioids to understand their effects on abusers. 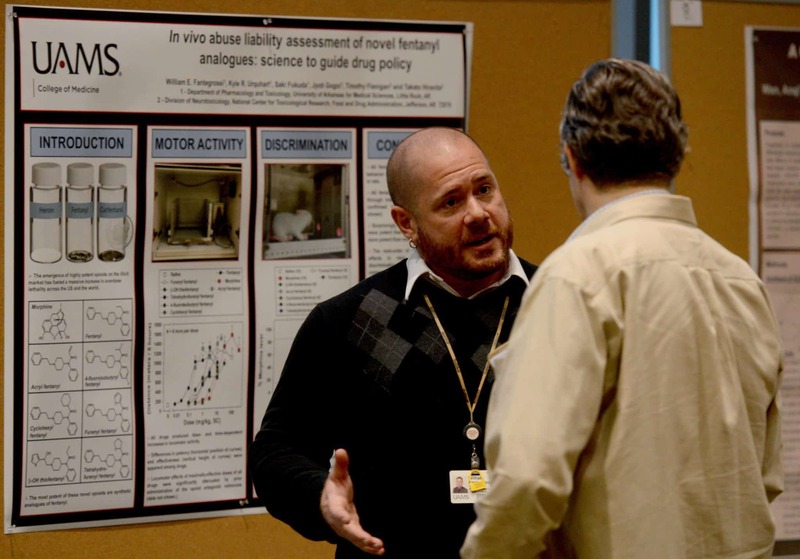 That work included not only presentations from UAMS researchers, but researchers from the Central Arkansas Veterans Healthcare System, which adjoins the UAMS campus. The event is intended to foster scientific collaboration by sharing research. Among those was the work of student researcher Mary Thannisch, who presented work done in collaboration with Benjamin Teeter, Ph.D., of the UAMS College of Pharmacy, on finding ways to increase prescription of overdose prevention medication naloxone among pharmacists. “Last year, Arkansas passed a law allowing pharmacists to prescribe naloxone to the public instead of going to a physician. But since that’s happened, the prescription rate has not been very high. There’s a certain stigma attached to naloxone, because most people think it’s only for addicts,” Thannisch said. “However, in addition to addicts, our research also targets the accidental overdoses that might happen, such as in older patients on multiple medications” or in households with very young children. 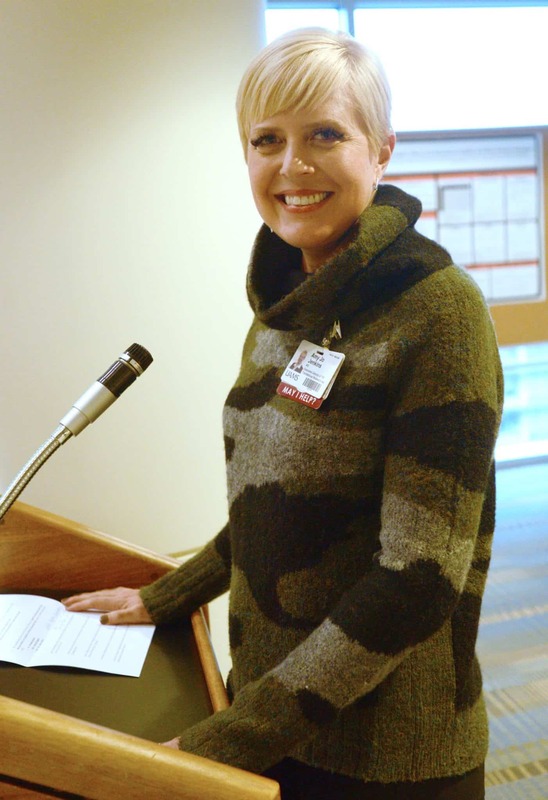 Thannisch said the work included studying ways for pharmacists, who in many cases – particularly in independently owned pharmacies – know their patients personally, to start a conversation about prescribing naloxone with opioids as a preventative measure. However, their surveys showed many pharmacists don’t quite feel they have the right training to begin those conversations. 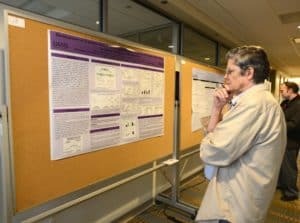 Posters at the event show research into a variety of approaches to tackle the epidemic, from curbing withdrawal to alternative medications. Ravi Nahata, M.D., a UAMS assistant professor and staff psychiatrist with the VA, presented work that gauged the acceptability and interest of opioid-addicted patients to using naltrexone, a medication often used to treat heroin addicts. Nahata said he and fellow researchers hypothesized opioid users would be hesitant to explore the medication for fear of stigma, but found exactly the opposite reaction in surveys. “Our hypothesis was that people exposed to methadone or Suboxone would be less interested in naltrexone, but our finding was actually the opposite. People with exposure were likely to consider it,” he said. The survey also collected data from those who were not interested in naltrexone. Their reasons included fear of needles, potential side effects, prohibitive cost and simply not being ready to end opioid use. 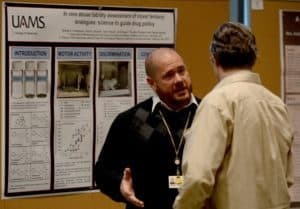 While there is still much work to do in combatting the multifaceted problem of opioid use throughout the United States, events such as the showcase not only help further research by fostering collaboration, they demonstrate the vital role academic research centers like UAMS play in finding solutions. “I think the public recognizes that academic research centers are where research is done to improve human health, so I think they expect us to take the lead. If not us, then who else is going to do it?” said Cornett.